1350 Ala Moana is located in a busy corner, directly across from the Ala Moana Shopping Center and the expansive beach park. 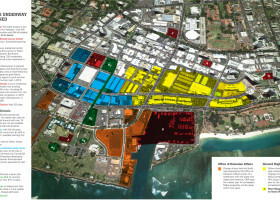 Honolulu’s best new developments are on this block including the Nauru, Hawaiki and Hokua. This is a more traditionally designed building compared to it’s super-luxury neighbors. It has nice amenities generous lanais and is located in a convenient and busy location. Common areas have been upgraded recently. Unobstructed views of the ocean can be had from all units. Grassy recreation area is atop the parking structure. The owner must supply air conditioning. Security features include an Entercom, locked lobby and private guards.